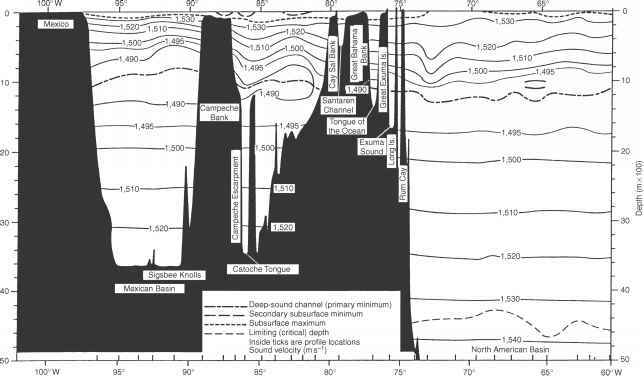 extensive data set collected during the AMOS program (Marsh and Schulkin, 1955) has been used to characterize TL in the surface duct in the frequency range 2-8 kHz. Graphical results derived from Condron etal. (1955) are summarized in Figures 3.22 and 3.23. These figures demonstrate the importance of source-receiver geometry (relative depths) in surface duct propagation, particularly in those cases where the source and receiver are situated on opposite sides of the layer depth (referred to as cross-layer geometries).